THE WOONSOCKET MEMORIAL CROSS WAS ERECTED 91 YEARS AGO. 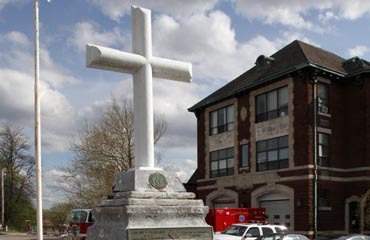 The Woonsocket, R.I. Cross was erected in 1921 as a memorial to U.S. servicemen who answered this nation’s call to duty in World War I. The Mount Soledad Cross in San Diego was erected in 1954 to honor those who gave their lives in defense of the stars and stripes in World War II. The Big Mountain Jesus statue in Whitefish, Mont. was installed in 1955 in tribute to veterans of the Great War. How ironic that, on this day on which a grateful nation pays homage to America’s sons and daughters that have fallen in battle, the three aforementioned war memorials are in danger of being removed from the respective sites on which they have stood for more than half a century. Well Congress made no law creating the war memorials at Woonsocket, Mount Soledad and Whitefish. Nor did lawmakers commission the crosses or statue. The memorials, the Christian icons, were all the work of private organizations. But the time to make that dubious argument was back in the 1920s, when the Woonsocket Cross was erected, and the 1950s, when the Mount Soledad Cross was erected and Big Mountain Jesus installed. Not 90-something years or 50-something years after the fact. And just how far are the courts going to let atheist hate groups go? Like the so-called Freedom From Religion Foundation, based in Madison, Wisconsin, which has threatened legal action against both the city of Woonsocket and the U.S. Forest Service (which leases the land on which Big Mountain Jesus sits to a private ski resort). The atheist extremists at Freedom From Religion Foundation – who not only have petitioned the courts to order removal of religious symbols at war memorials, but also to block the annual National Day of Prayer, and to strike the words “In God We Trust” from U.S. currency – would probably answer in the affirmative. That is why they are unworthy of the freedom for which America’s sons and daughters in uniform have fought and died. For the atheists begrudge our fallen heroes a few acres of public land in places like Woonsocket, Mount Soledad and Whitefish simply because the war memorials there invoke the Son of Man. 28 May	This entry was published on May 28, 2012 at 7:24 AM. It’s filed under ATHEISM and tagged BIG MOUNTAIN JESUS, freedom from religion foundation, MEMORIAL DAY, MOUNT SOLEDAD CROSS, WAR MEMORIAL, WOONSOCKET CROSS. Bookmark the permalink. Follow any comments here with the RSS feed for this post. The land the monument sits on was dedicated to William Jolicouer in 1921, but there was no cross there until 1952, when the site was re-dictated to the three Gagne brothers who died in WWII. The cross was erected during the Cold War, when America so feared Soviet and Maoist Communism that it virtually threw away the Bill of Rights and in addition to adding God to our money and our Pledge, erected this cross and most of the ten commandment monuments we see sprinkled across the land today. Asking that this cross be moved to private property does does insult our nation’s veterans, it honors them, because it shows that we have not forgotten those values these brave men and women have fought for. So should the crosses and Stars of David be removed from the headstones of our war dead buried at our national cemetaries? I’m not sure how your question follows. There are no bodies buried at Jolicoer Place. No one is talking about graveyard markers here. The monument is dedicated to men who died in wars, secular wars fought by nations, and there is no reason why a cross should top this monument other than to pander to religion. In fact, search the cases mentioned in this article and you will see that one of them concerned graveyards, so where does this question come from? It comes from a dishonest misrepresentation of the facts. You are making the case that a Cross should be removed from a war memorial that sits on public land. It must follow, then, that Crosses and other religious iconology should be removed, as well, from national cementaries that sit on public land. You make a strong case, but I disagree. There’s a difference between interning a body, and respecting the final wishes of the person being buried and the family, and erecting a monument to them, and commemorating their service. In Woonsocket, there are more than a dozen memorials to various veterans and fallen soldiers. Some no longer exist, or are long forgotten. Some are in terrible disrepair, others are well maintained. But only one has any kind of religious message attached. And that message has nothing to do with the veterans, but with the time period in which it was built. Defacing a memorial is any way is just plain disrespectful. What was done at a different time period (when Christian symbols were considered to be commonplace and not an affront) is DONE. Leave it alone and move on. No one is asking that the memorial be defaced. They are asking that it be removed from public land, and placed on private land. In fact, several veteran’s groups have volunteered to find a much more visible home for it. The monument right now is in terrible condition, it’s virtually rotting away. The attention brought by the letter from the FFRF has allowed the city to raise $15,000 in order to fix it up, something that wasn’t going to happen before. So in a sense, the atheists you’re complaining about have lead to a situation where the memorial can be fixed up and given a more prominent location in the city, and move it from public land where it clearly violates the separation clause of the First Amendment. It’s a win for all sides. Why are you complaining? What are the atheists whining about? The Supreme Court defined “secular humanism” as a religion! I did not know this about the memorial–thanks.